I have a 2015 S4 and I am need of replacing the OE pads. 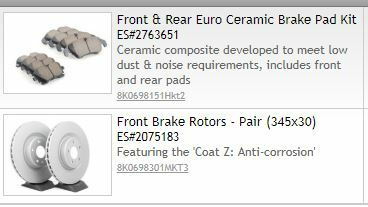 I hate the brake dust from the OE semi-metallic and am looking at alternatives. This is a daily driver with no track day plans in the near future. Would also consider upgrading OE rotors to something cross drilled and/or slotted, but again this would be more for appearance than performance necessarily. Any advice would be much appreciated on replacement pad options (ceramic?) and performance pad/rotor combos. Thanks in advance. BTW, you still get dust, it's just lighter color and not as visible. My advice is post this on the Audizine B8 S4 if you want to get a few more recommendations. Much more activity there.this forum is on life support. GP- You're like the caretaker of an abandoned estate. Not a good answer GP. A better answer would be "Akebono is a great aftermarket replacement pad." I am the Ghost of AW B8 S4 Forum Past. Perhaps not the best choice for all, but definitely a good one. I second the ghostly sentiments on the Akebonos from experience.